Paul McGann (born November 14, 1959 in Liverpool) is an English actor who made his name on the BBC serial The Monocled Mutineer, in which he played the lead role. He is also known for his role in Withnail and I, and for portraying the Eighth Doctor in the 1996 Doctor Who television movie and subsequent tie-in media. On January 10, 1996, it was announced that Paul McGann would play the eighth incarnation of the Doctor in the Doctor Who television movie. The television movie also starred Eric Roberts, Daphne Ashbrook, and the outgoing Seventh Doctor, Sylvester McCoy who agreed to film a regeneration scene. McGann's brother, Mark McGann, also auditioned for the title role. The Doctor Who television movie was a joint venture between the BBC, Universal Studios and the Fox Broadcasting Network. McGann had signed a contract to appear as the Eighth Doctor in a new Doctor Who series, if Fox or Universal exercised their option. Thus, the television movie was supposed to be a "back door pilot" in that, if it obtained respectable ratings, the new series would continue to be produced. The movie aired on May 14, 1996 in the US and on May 27, 1996 in the UK. Although it earned 9.08 million viewers and was very successful in the UK, ratings were very low in the United States. As a consequence, Fox did not exercise its option to pick up the series and Universal could not find another network who was interested in airing a new Doctor Who series. 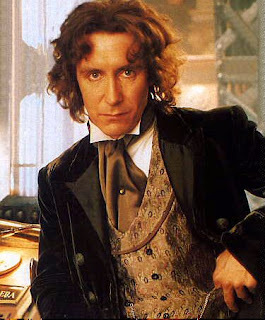 Thus no new series was produced until 2005, after all the contractual rights had returned to the BBC, and the movie became McGann's only televised appearance as the Eighth Doctor. For nine years, McGann was treated as the "current" Doctor by the majority of fandom until Christopher Eccleston assumed the role in 2005. In terms of being the "current" actor playing the Doctor, McGann (1996-2005) is tied with Sylvester McCoy (1987-1996) as being the longest serving current Doctor, with nine years each, although the show was not in production for much of this time. McGann's single appearance as the Doctor in the television movie makes him the actor with the shortest "screen time" in that role.